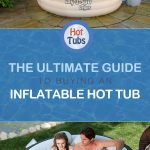 Hello and welcome to our Inflatable hot tub guide, a site devoted to helping you find your perfect inflatable hot tub to enjoy this Summer. We review an check out some of the most popular hot tub spas on the market and give you the low down on what to look for and the differences between them all. Weather you have a small garden or a large patio an inflatable hot tub is perfect, ranging from smaller models holding 2 – 4 people, up to larger spas that will hold up to 8 people! Perfect for those evenings with friends. Hot Tub Vs Jacuzzi – Is there a difference?